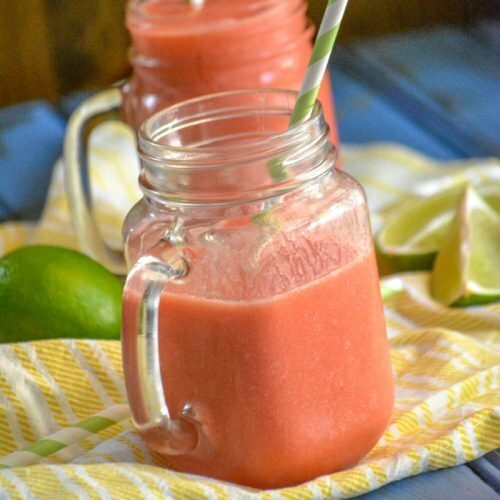 There’s nothing better, on a hot Summer day, than sippin’ on an ice cold smoothie. It’s like paradise with ever sip. Don’t believe me? Get one, and then tell me the experience wasn’t magical. While we live in a populated town, a solid suburb, there aren’t that many places to go to for this kinda thing. Despite all that, there does seem to be a smoothie shop on every other corner, along the long stretch home. Tropical Smoothie Cafe, to be exact. We love to hit up there business when it’s super hot outside. It’s a simple cool treat, that can quickly change an afternoon of errands into something enjoyable. My favorite has always been the Sunset Sunrise version. Still a hard yes for me! The Hubs always tries something new every time, usually in the very healthy vein. And he almost always hates it. His sweet tooth getting in the way and all. He also always takes a sip of all of ours, to ‘sample’ them. Which is how he discovered his love for the Blimey Limey. 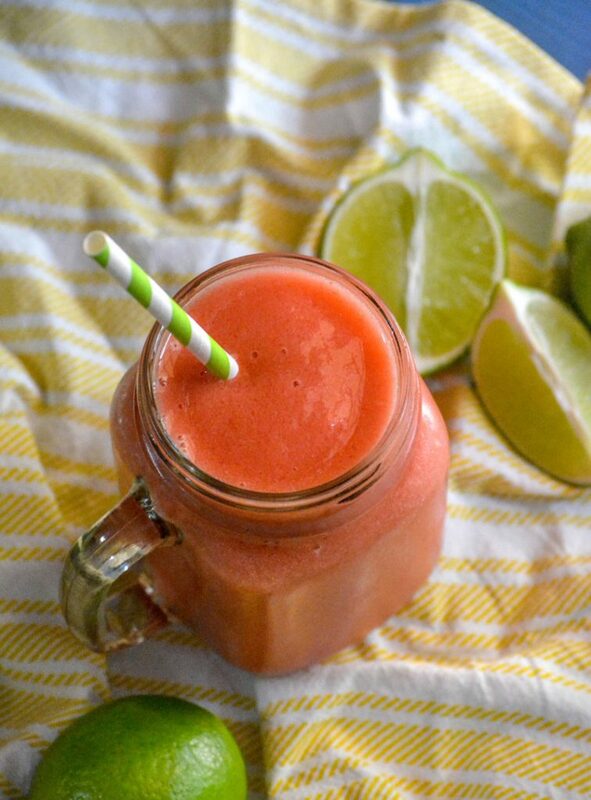 Our Copy Cat Tropical Smoothie Blimey Limey features the same key flavors as it’s official counter part: strawberry, pineapple, orange, and a bit of lime. 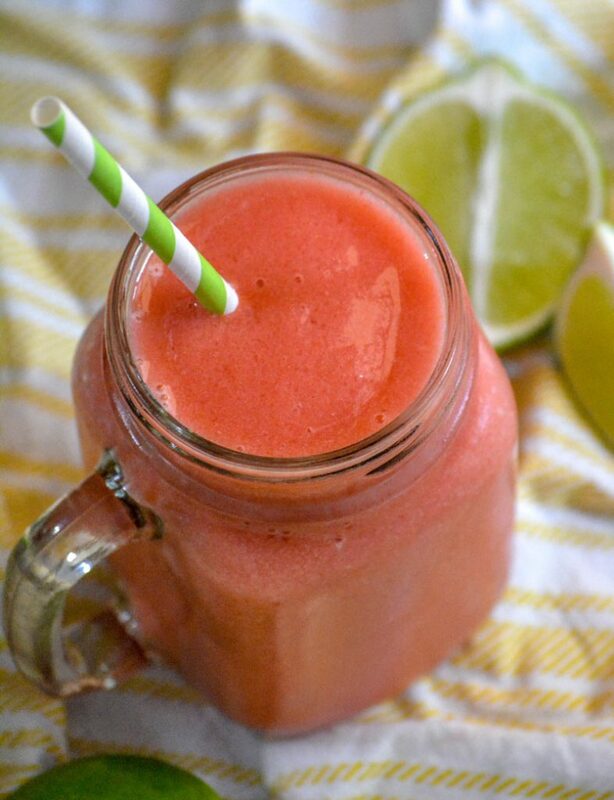 A spot on copy cat of the restaurant favorite, this Copy Cat Tropical Smoothie Blimey Limey features frozen strawberries and juicy pineapple chunks, combined with a mixture of fresh limeade and orange juice a little ice and sugar are added to the mixture before being blended smooth. It’s refreshing, flavor in every single sip and the perfect way to embrace Summer. An added bonus being that it’s easy to whip up at any time, and the absolute yummiest way to stave off the oppressive heat. 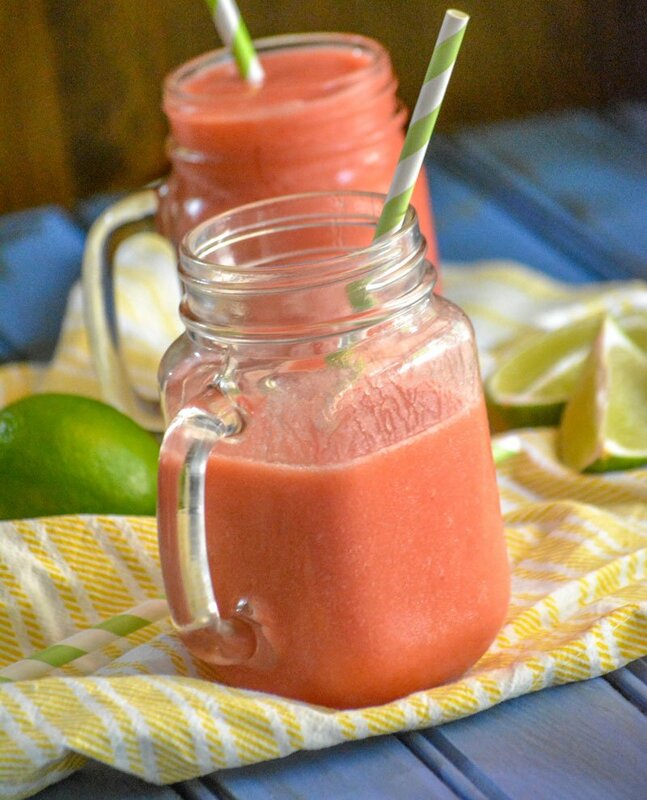 Other Summer drink ideas you might also enjoy: Healthy Peach Milkshakes, Watermelon Slushies, Sweet Southern Strawberry Iced Tea, & Sweet Black Cherry Limeade. 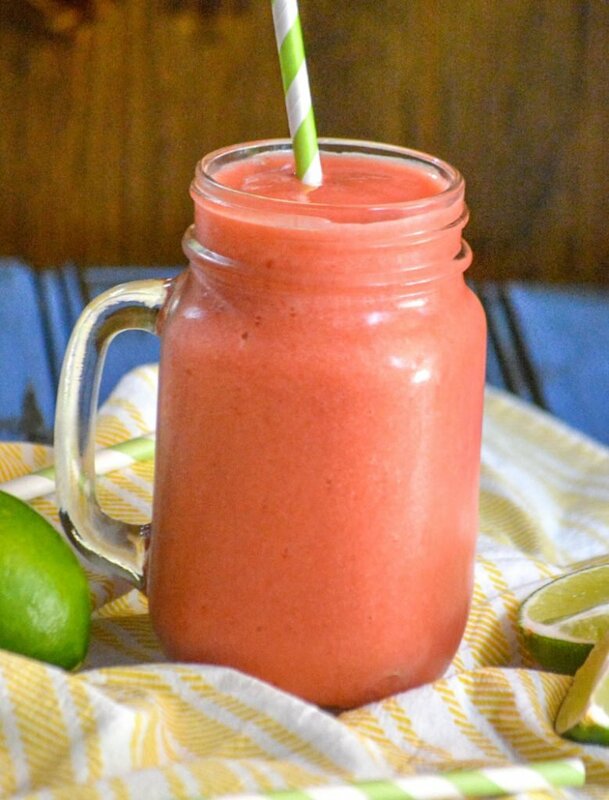 An easy copy cat recipe for one of your favorite refreshing, store-bought smoothies. Place all the ingredients in a high powered blender. Blend until completely smooth. 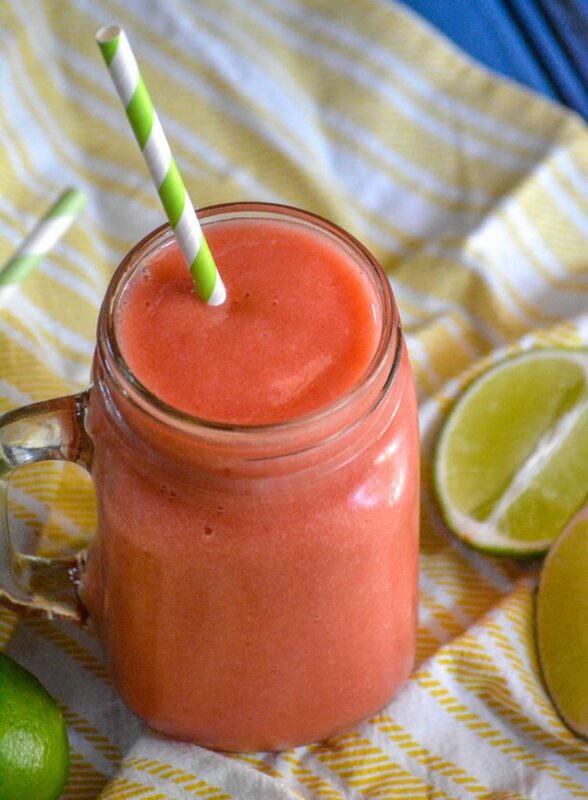 Pour the smoothie into two large cups, add straws, and enjoy! Delectably cooling… and not just for breakfast, either! Thanks for bringing this to the table, or lounge chair, at Fiesta Friday!